Being able to sell yourself through a captivating resume in today’s hyper-competitive job market is more important now than ever before. Here’s a quick step-by-step guide to revamping your own resume with Visme, a simple drag-and-drop tool for non-designers. Login to your Visme account at www.visme.co. Click Create New on the top left of the screen in your dashboard. Choose Infographic from the content menu. 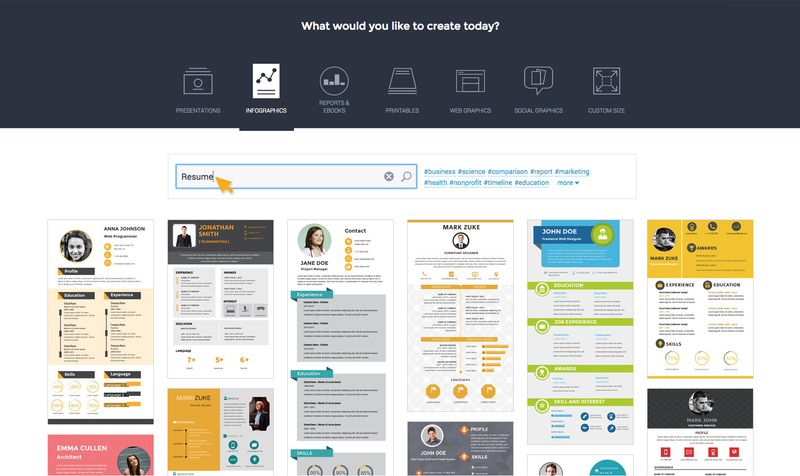 In the search bar, type in the term “resume” to browse through hundreds of resume templates. 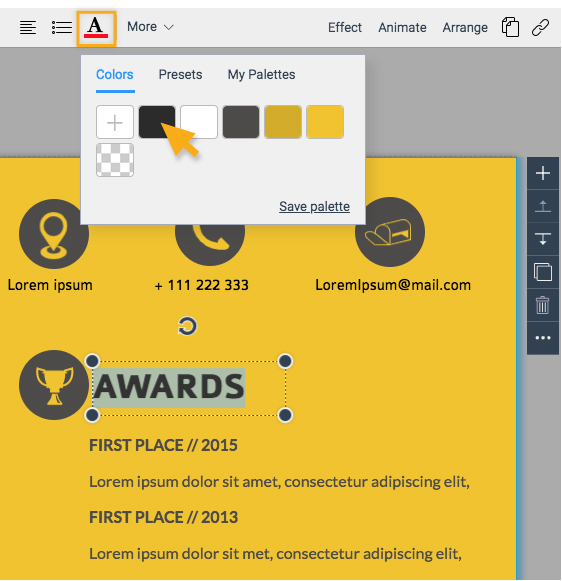 Once you’ve decided on a design, simply click on the theme to customize it. When you are editing your project, click Basic from the Left Panel. Then click on the Suggested Content tab. Select Text Blocks for your content options and choose your desire text box styles you wish to insert. Once you do, you can then choose from hundreds of fonts, change the color, size or apply formatting (bold, italic or underline). If you want to add a new text box with the same style and color as the ones already in the template, simply duplicate the text or copy and paste the text box. Tip: To neatly align your text and objects, simply navigate to the Menu at the top left of your screen, click View Options and activate the Show Grid. You can also use the align tool by selecting your texts and objects then click your desire alignment. To upload your picture, simply drag-and-drop your photo into the project or go to Graphic from the left panel. In the Photos tab, click Upload to find your picture and open it. Once you’ve inserted your image with your image selected, click Frames. Choose your desire shape. You then adjust the size and crop the area by clicking and dragging the corners of the frame. Tip: Depending on the position and company you’re applying to, including a photo of yourself may be inadvisable. In some cases, such as modeling or acting positions, not including one is a poor form. Select a text box, shape or icon. You then click on the color swatch at the top of the menu bar. Apply your color in Colors tab. You can also click on Presets tab to choose any of the predefined color combinations, or create your own color palettes in My Palettes. Tip: You can apply your own color scheme by clicking on the plus sign under the My Colors tab in the pop-up menu and inserting the hex code of the specific hue. To find relevant icons for your resume, select Graphics from the left panel. Under the Icons & Shapes tab, you are able to find any icon to fit your needs. There are many categories and styles (solid, filled, outline, etc) to choose from. You could also select an existing icon on your resume to replace a new icon. Click on Replace icon on the top left of the screen and it will direct you to the Graphic from the left panel where you can find varieties of icons. To create a cohesive and professional look, choose one type of icon style (outline, flat or glyph) and stick to it throughout your visual resume. You can do this easily using our infographic widgets. Click on Data from the left panel and choose from any of the data visualizations you wish to add. You can then customize them with your own values and text colors. Tip: You can also visualize your skills and strengths with a horizontal bar chart, as seen in the video above. In this version, you can go all out by inserting a video of yourself or even an audio narration. To do this, select Media from the left panel and click on Add Video option. 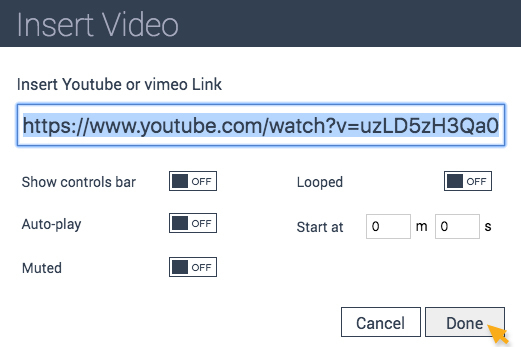 A pop-up window will appear and allow you to paste your URL (Youtube or Vimeo Link). Click Done. 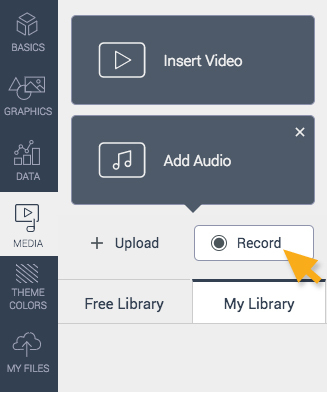 To record your own audio (which will play automatically when a visitor views your resume online), select Media from the left panel and click on Add Audio. Click on Record and adjust as needed. You can also include Social Media icons (LinkedIn or Twitter) that you can then link to your online profiles. 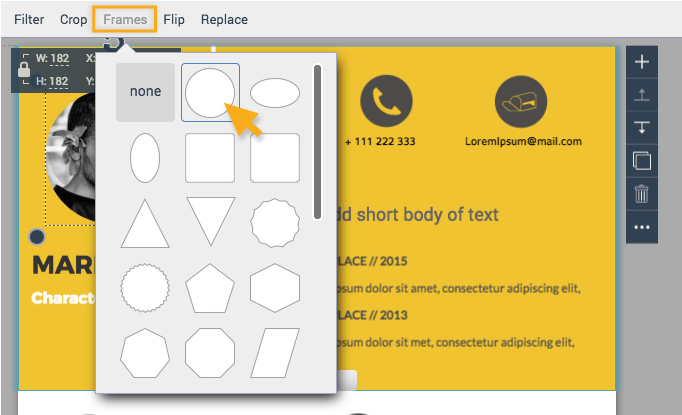 To do this, select Graphics from the left panel, under the Icons and Shapes tab, go to Buttons category. Select an icon and then click on the Link option and paste the URL. You can also include an icon that links to your online portfolio. Tip: So that your viewers can see your resume in full-screen mode, make sure to click on Publish and activate the Responsive option under the Publish Settings tab. 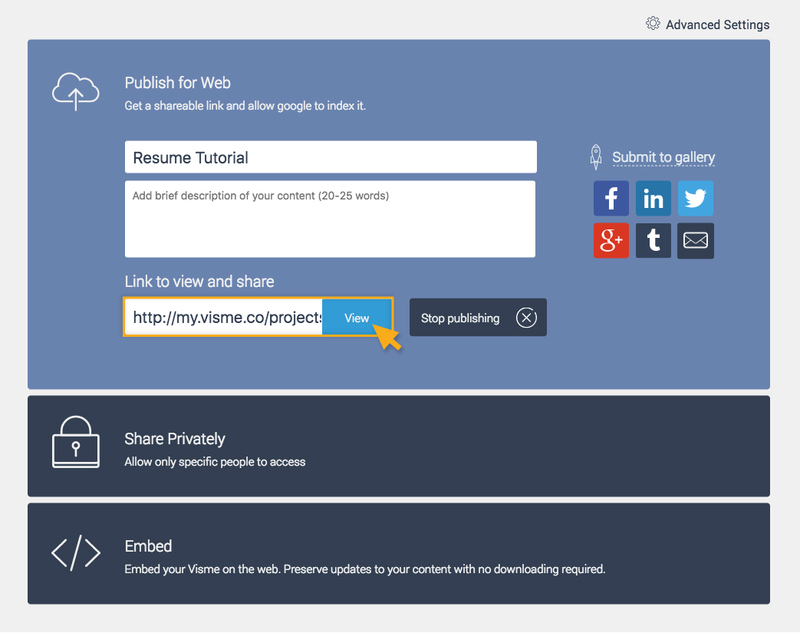 Finally, you can share your resume by clicking Share at the top right of the screen. You then go to Publish for Web option to get the link to share online. 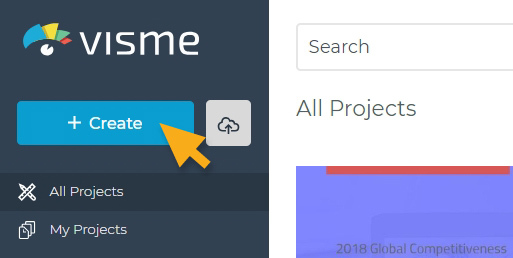 Tip: You can easily Share Privately if you wish to keep your project Private. Simply click Share Privately option instead of Publish for Web. For private project, it is password protected.